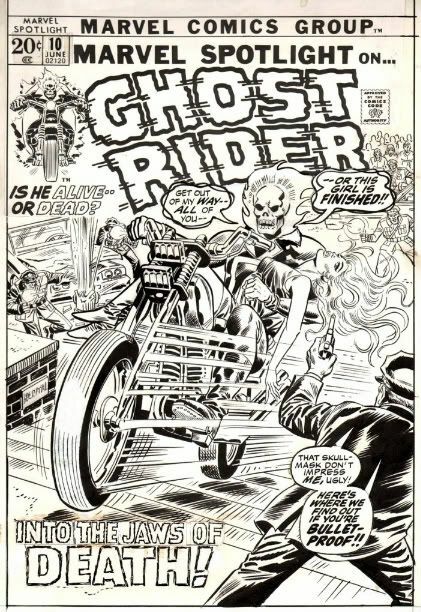 With a successful Marvel Entertainment big budget feature starring Nickolas Cage in the title role, Ghost Rider debuted in Marvel Spotlight #5 with stories by Archie Goodwin and artist Mike Ploog in 1973. 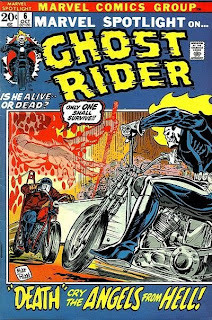 Having had a popular Western hero of the same name steadily losing interest with readers over time, Marvel Comics gambled that bikers would be more popular in 1973 that cowboys with their new version of this rider with a tortured soul. Jonny Blaze was a clean-cut cyclist who became the unwilling host of an evil spirit named Zarathos who changed him into a "demon biker" with a wicked super-charged chopper motorcycle and flaming skull head. Often taking on Satan and his horde of demons, this self-titled series lasting eighty one issues in its first incarnation, after its five issue try-out introduction. 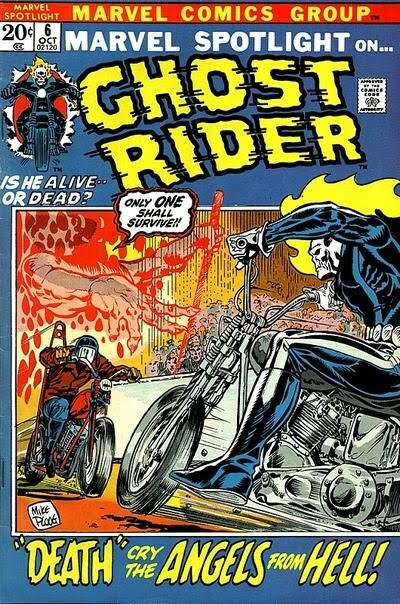 The Ghost Rider even was once rescued by his Western counterpart when he was unable to overcome an evil coven assembled against him, until they combined their otherworldly powers to save the day in the historic Ghost Rider #56. In 1990 a new series was launched with more gruesome hard hitting tales showcasing the violence and gore when compared with their earlier hot rod inspired incarnations. 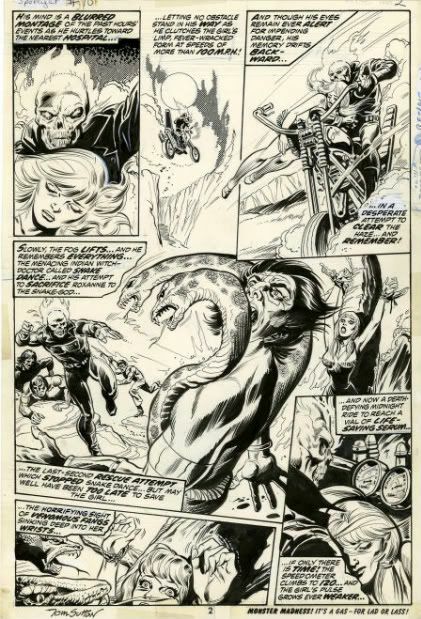 Produced by foreign born artists Javier Saltares and Mark Texeira, it new look suited the character well enough to keep the sales going strong for Ghost Rider to still be published to the present day. Pat Boyette's "The Rain Stopper!"